My daughter wanting the terra-cotta color, and was out of stock, but she got the purple/gray one, and she really liked. 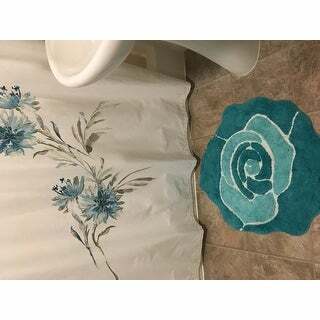 Jessica Simpson Bloom bath rug. 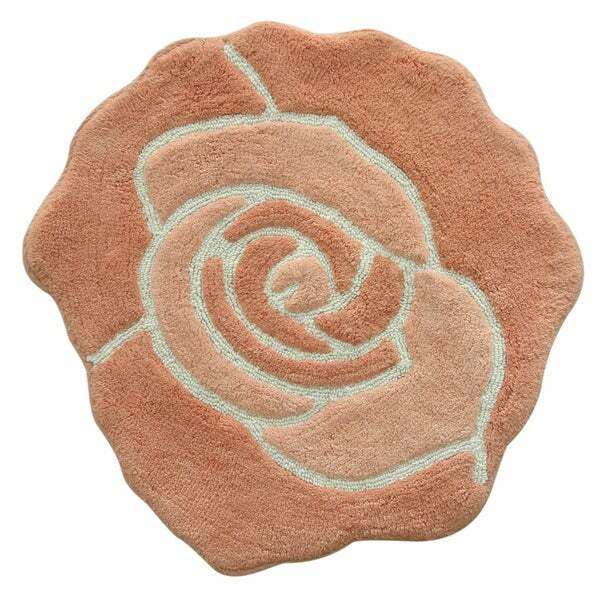 This 100% cotton bath rug is constructed with a high/low, cut and loop design in the shape of a flower. The bath rug features tonal shades combined with white. Shaped bath rugs are the hottest thing on the market. The perfect addition to any bathroom. Dimensions 22.0 In. X 5.0 In. X 5.0 In. 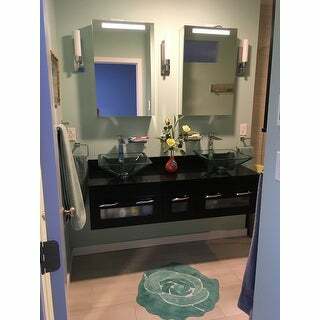 I was looking for something beautiful and unique in the turquoise color family for our main bathroom area and the water closet. This couldn't have been any more perfect if I had designed it myself. 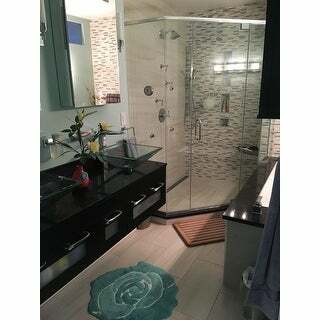 The shape, colors, and concept just added to the spa-like look and feel of one of our favorite rooms in our beautifully renovated house, and there are several of such rooms that give us a sense of well-being and tranquility, but our master bath tops them all. Thanks, in no small part to the touch that this rug brings to the overall decor and ambiance. I expected more from this product. 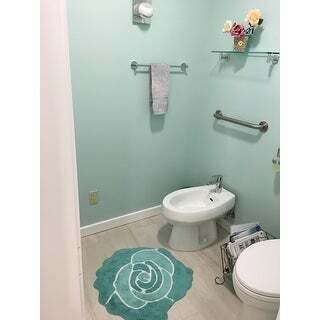 I bought a bath rug from another store and cheaper but it looks and feels really good, so I feel like it should have more quality for the price. I must admit, it is very pretty and I will recommend it if you plan on using it as a decor. The colors are true to the photo, the flowers shape I love. The rug arrived quickly. I originally ordered the wrong color, needed the blue. The return process was easy and a new rug was dispatched. The rug is really pretty and very soft. Using it for a Victorian styled half bath and it is perfect in front of the pedestal sink. Would definitely order again. This rug by Jessica Simpson is very pretty. It is well made. The colors are well placed. It is soft on your bare feet. It adds charm to room. Very satisfied with this. The color is just as pictured and it's thick and have a nice quality. Love the rose design. I purchased two of the "tea rose" color to go in my bathroom. I have searched for months for this color and wasted money buying rugs that I hoped would blend in. I was so happy when I found this color to be a perfect match for my towels and other accessories. I placed two rugs on the floor and was quite surprised and pleased at the unique design they created! I was extremely pleased with these rugs. They are made very well and are very attractive. I am going to purchase 2 more of these rugs. I bought the aqua rug and it looks just like the picture. Beautiful, unique, and feminine. Really a nice piece to have in the bathroom. It's pretty but there is no non-skid backing which makes it useless in a bathroom!!! I love this rug. It’s little but lushious and fits perfectly in the spot where it was needed. I’m going to order two more today. Lovely rug, but moves around a bit, suggest adding a non slip protector underneath so it doesn’t slide around. These rugs are very cute. Not as large as expected...but I think I'll keep them. True to color. It's a cute rug and I like the color. Would have preferred it to be more teal but I'm always a fan of blue. Perfect, funky accent for a rather minimalist bathroom. This rug is just perfect! It fits in my small powder room like it was custom designed and the coral color is beautiful. We recently remodeled this bathroom and the walls are a dark coral peach. A perfect match. It has a multi-dimensional appearance and a slip resistant backing. A great value. This mat is perfect for my bathroom. The blue is a bit more turquoise than expected. I have not laundered it yet so that will be the final factor. I ordered the apricot colored rug and it is beautiful! True to color and plush. "does this rug no come in pink anymore?" unique, and just the size I need. I like round shape. I wanted something different for bath and not traditional.